A city of kebabs and nawabs, of architecture and history, of literature and culture – that is Lucknow in a nutshell for you. The capital and the largest city of Uttar Pradesh, Lucknow, situated on the banks of river Gomti, welcomes you with a heartwarming note of "Muskuraiyein, kyunki aap Lucknow mein hai". 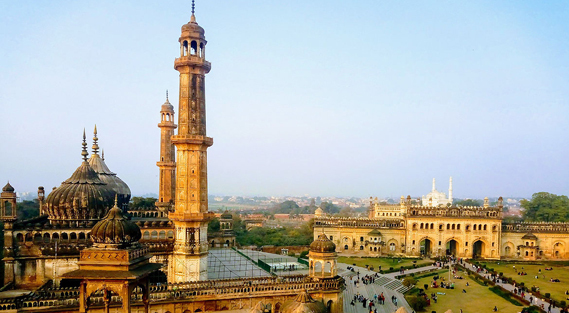 Known as the ‘City of Nawabs’, Lucknow has a charm to it that is hard to resist. While the city itself is rich and opulent, the people of Lucknow also follow an endearing 'pehle aap' (you first) culture, which always leaves behind a smile on the faces of its visitors. From a slice of rich colonial history to modernized museums, the 'City of Nawabs' beautifully brings together the opulence of a glittering past and the simplicity of a modern city. Rumi Darwaza, the Mughal Gateway built in the centre of the capital divides Lucknow into the 'Old Lucknow' which is ancient, more crowded, and comprises most of the Muslim population, and the 'New Lucknow' which is urban and one of the most planned cities of Asia. Old Lucknow is home to the iconic Mughal monument known as the Bara Imambara, where you will find the Bhool Bhulaiya, which is basically a complex, an intricately designed labyrinth with around 500 almost-identical doors and around a thousand passageways connected by multiple flights of stairs. The Bara Imambara is an architectural marvel in and of itself and is an exemplary embodiment of Awadhi architecture and culture. Close by, Husainabad Clock Tower exhibits traces of Victorian architecture, while Moti Mahal serves as an excellent vantage point for bird watching. Most of Old Lucknow is well-known for its bustling, vibrant streets, its authentic, mouth-watering kebab and biriyani outlets, its lakhnavi chikan market, and its wholesale jewellery stores. New Lucknow, on the other hand, hosts people of varied cultures and is structurally planned with wide roads, shopping malls and parks built to serve varied entertainment purposes. The most famous among these parks are the Ambedkar Park and the Gomti Riverfront Park, both ideal places for visiting and strolling around with friends and family in the evening. The Ambedkar Park, in particular, is spread across a staggering 107 acres of land, and is a colossal memorial park built entirely out of red sandstone. Despite being a park, the place doesn’t actually have any trees, and the only nature connect you will find here are the beautiful elephant stone statues, which are eye-catching, nevertheless. The Marine Drive of Lucknow, situated beside the Ambedkar Park, is a beautiful boulevard devoid of transport, and both locals, as well as tourists, come here during the mornings and the evenings for a casual walk or a jog. Hazratganj, a major shopping area located in the heart of the city, is famous for its 'chaat' and 'kulfi' eateries, posh Mughlai restaurants, and various shopping complexes. All the buildings in Hazratganj have a distinct Victorian architecture, and you can shop for literally anything you want here – starting from inexpensive accessories and trinkets to high-end clothes, shoes and jewellery. The Bara Imambara of Lucknow is one of the most famous monuments of the city. Also known as Asfi Imambara, after the name of the Nawab of Lucknow who got it constructed, it is an important place of worship for the Muslims who come here every year to celebrate the religious festival of Muharram. The Imambara is primarily known for its incredible maze, known as Bhul Bhulaiya locally, which is located on the upper floor of the monument. Said to be the world's largest unsupported structure, Bara Imambara is considered a marvel of engineering and a fine specimen of Mughal architecture. In the vicinity, religious centres like the Asifi Mosque, Shahi Bawali, Rumi Darwaja, etc., are also present for one to explore. The Bara Imambara has a unique style of construction. The central hall of Bara Imambara, which is said to be the largest arched hall in the world, measures 50 meters long and goes up to a height of 15 meters. The whole building is made of Lakhanui bricks, which are a bit small in size, and lime plaster. No wood or metal has been used in the construction. One can also have a view of the grave of Nawab Asaf-Ud-Dowlah and his crown, which is kept in the central hall. The Bara Imambara is worth seeing in its own right, but the unusual labyrinth of corridors on its upper floor (Bhul Bhulaiya) is what steals the show! Located in the heart of Lucknow, the Nawab Wazid Ali Shah Prani Udyan or Lucknow Zoo is a favourite haunt of wildlife enthusiasts from all over the city. This massive zoo is spread over an area of 71.6 acres and was established in the year 1921 to commemorate the visit of His Royal Highness, the Prince of Wales to Lucknow. It was formerly known as the Prince of Wales Zoo but was later renamed after. Some of the fascinating animals and birds such as Royal Bengal Tiger, White Tiger, Lion, Wolf, Great Pied Hornbill, Golden Pheasant and Silver Pheasant can be spotted here in their natural habitat. In addition to being a safe house for animals such as Hoolock Gibbon, Himalayan Black Bear, Indian Rhinoceros, Blackbuck, Swamp Deer, Barking Deer and Hog Deer, the Lucknow Zoo also has a number of fun-filled activities for its visitors. You can observe the vintage train that is exhibited in the zoo premises, and if that leaves you wanting for more, hop aboard the toy train that runs through the zoo! The State Museum displaying artefacts from Awadh is also situated in the Lucknow Zoo. In addition to these, several events such as Wildlife Week and Children's day Celebration are regularly held here as well. The Chowk area in the Indian city of Lucknow is one of the oldest markets in the state as well as the whole of North India. Lucknow is an ancient city, and its presence and significance are ubiquitous throughout Indian history. Right from the eras of Badshahs and Nawabs to the rule of the British Lucknow has occupied quite a prominent place. A market area right in the heart of this colourful city will share the same essence. Chowk market is one of those places of the city that are a window into its rich cultural heritage. Beginning from Chikan work to succulent kebabs, one can find it all at the bustling street. Chowk market has more than 5000 shops spread around the narrow, labyrinthine cobweb of streets on both sides and sometimes taking much of the road itself. In these quaint shops, both bricked shops as well as temporary ones, you will find authentic chikankari and zardozi dresses, traditional handmade jewelleries, handcrafted home décor items from wood, bamboo and ivory, nagara shoes, ittar or perfume made from essence of real flowers, and innumerable other small and big items, in varieties beyond your imagination. Though a modern business hub selling products suitable for the urban, metropolitan tourists, somewhere, it still holds on to the Awadhi ambience of the past and remains true to its roots. Other than these, to soothe your tingling culinary senses, there are a handful of shops selling authentic Awadhi food - kebabs, biriyanis, paratha with chicken or mutton and milk products as well. A one day trip to the Chowk market means a true exploration of how Lucknow looks, feels and sounds like. The Chhota Imambara, or the Imambara of Hussainabad, is one of the most beautiful and attractive buildings in the old city of Lucknow in Uttar Pradesh in India. This imposing monument lies to the west of Bara Imambara and is a true sight to behold. The Chhota Imambara was initially a congregation hall for Shia Muslims that was built by Muhammad Ali Shah, who was the third Nawab of Awadh, in the year 1838. The Imambara was to serve as his own mausoleum as well as that of his mother, who is buried beside him in this prestigious monument. The Imambara is beautifully adorned with decorations and chandeliers at the time of special festivals, especially Muharram. In fact, this 19th-century building is also referred to as the 'Palace of Lights' by European visitors and writers because of the profuse decorations of the monument at specific events. Chhota Imambara is one of the most prominent historical structures of Lucknow. Architecturally, it is a beautiful amalgam of Charbagh, Indo-Islamic and Persian structural and architectural designs. The exterior of the temple is complete with Quranic verses which are written in Islamic calligraphy on the walls of the monument. However, it is not just the exterior of the Imambara which catches the fancy of the eager visitors. Even the interiors of the monument are designed and maintained with intricate details and utmost care. The sheer brilliance of Chhota Imambara during the festive season at night time gets imprinted on the mind of visitors and stays with them forever in the form of a beautiful memory. A hotspot of photo fanatics and history buffs, the Chhota Imambara attracts a large number of tourists every year, who visit the monument to appreciate its splendid beauty and to learn more about the history of the country. Rumi Darwaza in the heart of Lucknow looms over the busy everyday traffic of Lajpatnagar like an old guardian angel that has seen the city rise and fall. The ancient Awadhi architecture of Rumi Darwaza is one of those features of the old city of Lucknow which still clings on to the nostalgias of the past, like the horse driven Tonga cart. The creation of Rumi Darwaza has a very charitable reason behind it. When famine struck North India during 1748, the then Nawab of Lucknow came up with a plan that will feed his countrymen as well as give him something to cherish and be proud of. As per the plan, the Awadhi workers built the great Rumi Darwaza for him, in exchange for every day’s meal. Back then it was the gateway to the royal city and palace, and the architecture was a flattering imitation of a similar specimen which stood in the then Byzantine empire, now called Istanbul. Slowly and steadily, Rumi Darwaza has stopped being the majestic doorway to the royal residence, but it has nowhere lost its charm and significance as far as the culture of Lucknow is concerned. Instead of being abandoned, it has been incorporated into the modern world - such is the glory of the building. Through the arch of the Rumi Darwaza runs roadways to both sides and they remain busy, crowded and cacophonous all day long. The rush of vehicles and the brunt of time have weakened it, but it still stands ever strong and majestic. Farangi Mahal originally belonged to a French businessman named Neal. The French businessman had to give up his entire trade and belongings as per the royal decree. After being confiscated by the government as per the royal decree, the edifice was given to his Islamic consultant Mullah Asad bin Qutab Shaheed and Mullah Asad bin Qutabuddin Shaheed, his brother, by Aurangazeb, during his reign. This building was developed by the brothers into a full fledged Islamic school, which was often compared with Oxford and the Cambridge Universities. This house became a dominant Islamic institution of the 18th century. The institution is believed to have played a significant role in preserving the long tradition of the rich Islamic culture with its well-oriented curriculum and broad syllabus. Janeshwar Mishra Park is a newly constructed park, located in Gomti Nagar, Lucknow. The park is dedicated to a local namesake politician and is believed to be the 10th largest park in Asia. The park has a lush green atmosphere with a variety of plants and birds flocking the gardens. It comes under the green belt of Lucknow and is counted as a mini-forest. Initially known as Prince of Wales Zoological Gardens, Nawab Wazid Ali Shah Prani Udyan or Lucknow Zoological Garden is a massive zoological park situated in Hazratganj, Lucknow. The area has light marked trails to offers small treks. The place is a hotspot for nature photography and zoology students apart from regular tourists and local visitors. Aminabad is a large shopping centre that has several shops selling chikan embroidered garments. Located in the old part of Lucknow, the market has existed from the times of the Nawabs of Awadh. Made up of narrow lanes and by lanes, the market contains several small and medium sized shops. At the market, tourists can buy items of daily use, ladies fashion items, chikan kurta, chikan sarees, ornaments, jewellery, fashion garments, fancy dresses, and ladies wear, men’s chikan wear, footwear and other fancy items. Chandrika Devi Temple is situated in Aashiyana Lucknow and is dedicated to the Hindu Goddess Chandi - the combined form of Kali, Lakshmi and Saraswati. The shrine also has a pond in the premises where a statue of Lord Shiva is installed. The temple is thronged by a large number of pilgrims everyday; hence the best time to visit is during early morning. The most interesting thing about this temple is that it had India's first women priest Arunima Singh. She was honoured as the Mahant or chief priest of the temple when she was 25 years old. It is one of the most popular temples in Lucknow. Dedicated to Lord Shiva, the temple is said to fulfil everyone's wishes. Located on Saraswat Ghat, the temple has a beautiful location. It lies beside River Yamuna and has the serenity of an ancient temple. Monday is particularly popular in this temple because it is considered an auspicious day here. Therefore, the temple attracts visitors in hordes. The temple is also located close to some popular monuments in Lucknow. Located at Gomti Nagar in Lucknow, Fun Republic Mall is one of the most popular and one of the largest malls in the city. Replete with a plethora of fun activities, game zone, food stalls, eateries, apparels-garments-cosmetic stores and several big brand outlets, the mall also has a massive parking and other facilities. Shah Najaf Imambara is a replica of the tomb of Hazarat Ali in Iraq. Located on the south bank of River Gomti, the monument houses the remains of Ghazi-ud-din Haider and his three wives. Silver and golden tombs of his wives on either side flank the tomb of Ghazi-ud-din Haider. The golden tomb belongs to his European wife Mubarak Mahal. The pseudonym given to Maula Ali, the son-in-law of Prophet Muhammad was Shah Najaf. To pay homage to his efforts in protecting the nascent Islam, he was bestowed with the title of Haider-e-Khuda that means 'Lion of Allah' in Arabic. After becoming the fourth Caliph of Islam, he chose Najaf, a town in Iraq, as his seat of governance, during his caliphate. Following his death, he was buried in Najaf, owing to which he is called Shah Najaf, or The King of Najaf. This mausoleum of Nawab Ghazi-ud-din Haider is a white-domed structure. Ornamented with chandeliers in its interior, the monument had its dome covered with silver at one time. During the celebrations of Muharam, the building is used to hoard ‘tazia’, which is a complicated design of wood, bamboo and silver paper. The Ramakrishna Math started functioning in Nirlanagar seven decades ago. Made of marble and located amidst a garden, the math contains idols of Sri Ramakrishna, Holy Mother Sarada Devi and Swami Vivekananda. On the walls, figures like conch shell, disc, lotus, drum, trident, swans, thunderbolt and trident have been carved. The main aim of the math is the development of cultural, spiritual and devout activities, imbibing the teachings of Sri Ramakrishna, Holy Mother Sarada Devi and Swami Vivekananda. Located in Tehseenganj, Hussainabad in Lucknow city of Uttar Pradesh, Jama Masjid is a Muslim mosque built by King Mohammad Ali Shah Bahadur. Constructed on an elevated square platform, the mosque was built to outpass the grand Jama Masjid in Delhi. It boasts of a fancy decor with a lime plaster, adorned with stucco motifs and has high arched ceilings and sturdy pillars. Gautam Buddha Park offers an opportunity to enjoy paddle boating in the canal. Apart from having rides for children, the park is also used by political parties to hold rallies. Elephant or the Hati Park is located near this park. Located in between the Bada Imambara and the Martyrs Memorial, this park is very popular amongst families accompanied with kids. Begum Hazrat Mahal Park pays tribute to Begum Hazrat Mahal, who was the first wife of Nawab Wajid Ali Shah. As she played a very crucial role during the era of the First Freedom Movement in 1857, the State Government built a marble memorial in her honour in the old Victoria Park. Opened on 15 August 1962, the memorial was adorned with strings of flowers and brightened by multi-coloured bulbs and neon tubes. A rally ground once, the park has hosted several Dusshera celebrations and numerous Lucknow Mahotsavas. The coat of the Arms of Awadh Royal Family adorns the marble tablet that has four round brass plaques. Marine Drive is named after the famous Marine Drive in Mumbai. It is a picturesque strip of road adjacent to the River Gomti in Gomti Nagar, Lucknow. The spot is popular among the young crowd as a hangout place. Apart from that, people use it for jogging, cycling and similar activities. The path is sprinkled with benches to sit and relax. Spread over an area of 76 acres, Dr Ram Manohar Lohiya Park is a popular park in Gomti Nagar, Lucknow dedicated to the socialist Dr Ram Manohar Lohiya. The park is divided into four courtyards and simultaneously have four different entrances. Besides, it has vibrant lawns sprinkled with seasonal flowers and shrubbery. It is also used for jogging and morning yoga classes. Moti Mahal is situated on the banks of River Gomti facing Rana Pratap Road near Hazratganj. Often referred to as Pearl Palace, it was built by Nawab Saadat Ali Khan (1798-1814). It has derived its name due to its pearl like white building. Constructed by Nawab Saadat Ali Khan, between 1798 and 1814, it is situated alongside two other famous buildings, the Mubarak Manzil and the Shah Manzil. From the palatial building, the royal family used to watch animal combats, which used to be held on the other side of the Gomti River. Constructed as a citadel, the edifice served the purpose of birdwatching and also for watching enemy operations. Nawab Ghazi-ud-din Haider added the Shah Manzil and the Mubarak Manzil at the left and right side of the palatial building. Presently occupied by government offices, its lawn is today used for organising exhibitions, parties, marriage functions and others. Chattar Manzil has derived its name from its umbrella-shaped dome. Built by the Nawabs of Lucknow, its construction has some elements of European architecture. The construction of the edifice commenced during the reign of the Nawab of Lucknow, Ghazi-ud-din Haider. Owing to his demise before the construction of the edifice, his work was completed by his son Nasir-ud-din Haider. Large underground rooms and a dome surmounted by a gilt umbrella compose the edifice. The edifice was remodelled to serve as the office of the Central Drug Research Institute (CDRI). 1857 Memorial Museum contains exhibits that showcase the story of 1857 in a chronological order. The museum has been established keeping in view its importance during the First War of Indian Independence. A model of The Residency, old photographs, lithographs, paintings, documents and others are housed in the museum. The museum also contains period objects such as guns, swords, shields, cannons, rank badges, medals and other items. Part of the display is also formed by diorama and paintings on canvas showing some of the battle at The Residency and others relating to the theme. In the museum are also housed original photographs and lithographs of many sites, connected with the uprising of 1857. Exhibits of the museum also include paintings depicting significant events of the uprising, along with portraits of local heroes. Items compiled in the museum also include number of maps showing strategic positions in Lucknow and map of The Residency. On display in the museum are a drawing of the layout of the gallery and the centre of the uprising of 1857. In the ground floor that can be approached through a large double columned portico, four galleries are present. Seven galleries are present at the basement that can be accessed through spiral staircases. A new gallery in the basement showcases artefacts recovered during the excavation in the southern portion of The Residency complex. Various terracotta human and animal figurines, a loaded revolver, porcelain wares, cannon balls, terracotta roof tiles, fragments of wine bottles and silver plated whisk fly form the exhibits of the museum. Anandi Water Park is Northern India's biggest water park with maximum number of slider and events. We have always tried are candid efforts to give the best possible entertainment to our customers & we are overeuhelmed by the response which we get.It consists of 32 rides, allowing thrill seekers of all ages to experience one adrenaline rush after another without leaving the water.Slides are piece of attraction for childrens as well as adults. Anandi Water Park, established in Lucknow during the year 2002, will convince you that it's a unique water park for fun and adventure for all ages and everybody. It is probably Northern India's biggest water park with maximum number of slider and events. The Park's lush green beautiful lawns with natural greenery around it, make it most desirable place in the Lucknow city as well as the nearby cities. This site provides you information and necessary guidance that you should know before you proceed for Anandi Water Park. Swimming costumes, lockers, Lunch and snacks facilities are available at nominal charge. Located near Chhota Imambara and Hussainabad Clock Tower, Hussainabad Picture Gallery is a popular tourist attraction of Lucknow. The gallery houses life size portraits of regional rulers. It is built in the •Bardariê style with twelve doorways and was used as a summer house in olden days. It houses a mosque and pong and has •Mina Bazaarê in the front. Shaheed Smarak or Martyrsê Memorial is a white marbled pillar like structure standing amidst lush green lawns at Mukarimnagar, Qaiserbagh in Lucknow. The monument is dedicated to the martyrs who lost their lives in the freedom struggle for the country.